Convenient Carriages For the optional Ivarstead patch. 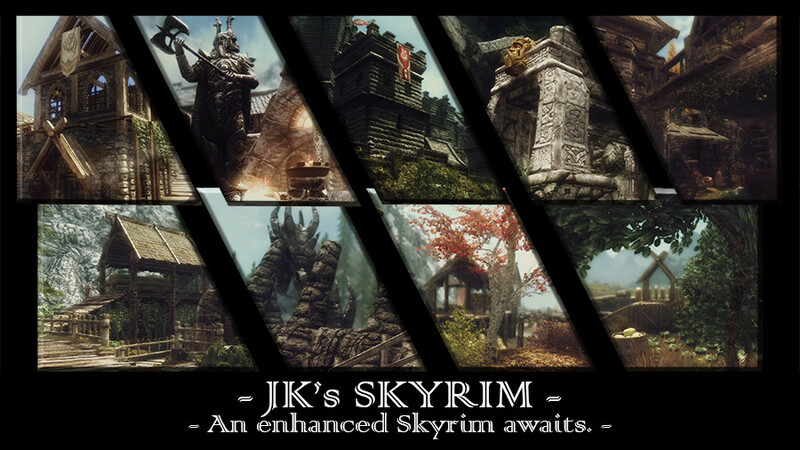 JK's Skyrim - Spanish Requiere el mod origial. Sobrescribir si pregunta por ello. Translations are ok, as long as they only include the translated ESP and proper credit is given. Mod authors are permitted to make a patch for their own mod that requires JK's Skyrim as a master. Please post a comment notifying us that you have added a patch. Please contact me for any other permission requests. Corrected an Object Bounds wild edit on one record and packaged the assets in a BSA. That's it. Navmesh cleaning with new version of xEdit. Removed floating armor in Falkreath graveyard that refused to "rest in peace"! Added Greater Skaal Village Patch to fix clipping balcony behind the Greathall. Fixed conflict with Animated Clutter. Animated Clutter replaced the vanilla sack mesh which was causing a CTD with JK's static sacks in Dawnstar. Added light markers to braziers at Riften's Temple of Mara and in Markarth. Fixed flora clipping in various cities. Added collision marker to wall and roof in Windhelm. Removed guard tower in Rorikstead that clipped with Immersive Citizens animal shed. Added Navcut marker to carriages in Rorikstead to improve follower pathing. Added ownership to horse in Rorikstead. Lowered pathway in Dawnstar for better fit with the environment. Arthmoor's Dawnstar, Dragon Bridge and Ivarstead individual patches released. Merged patch released for Arthmoor's villages combined into one. Bal Ruhn SE player home. Lowered snow drift in Windhelm for built in compatibility. Better City Entrances patch released. Thunderchild patch released moving the Pillar of Lightning Shield in Dawnstar 20 metres to the right. CTFO - Carriage & Ferries - Classic patch has been updated and sent to mod author for hosting. Sky Haven Temple - Gardens replacer esp has been updated and sent to the mod author for hosting. Merged Files and Version number listed below. All Classic Skyrim versions have been updated for SE. USLEEP changes have been carried forward into main file. 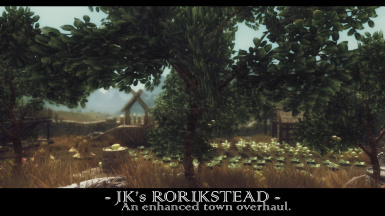 A lore-friendly and script-free Overhaul of the cities and towns of Skyrim. The vanilla theme of the towns has been greatly expanded upon giving each a unique, more immersive atmosphere; Riverwood (lumbar), Rorikstead (farming), Falkreath (graveyard), Dawnstar (port), Dragons Bridge (defensive outpost), etc. New buildings and vendors have been added to the villages making them more vibrant and useful. Town allegiance (banners, guards) dynamically change as the Civil War progresses. 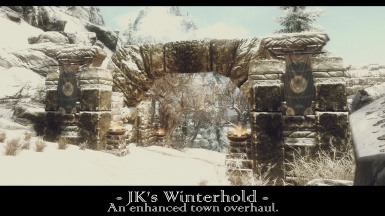 The overhaul covers Skyrim's 5 major cities; Whiterun (and Whiterun exterior), Windhelm, Solitude, Markarth and Riften. The towns of Riverwood, Dragonbridge, Ivarstead and Rorikstead. The small open villages of Falkreath, Morthal, Dawnstar, Winterhold and Skaal Village. Sky Haven Temple Exterior unlocked during the Main Quest. Mods that significantly change the above mentioned towns and villages will most likely not be compatible. 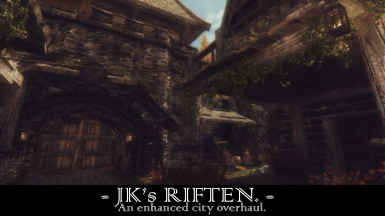 Mods altering the exterior of Windhelm, Solitude, Markarth and Riften are fully compatible. Whiterun's exterior has been modified inside the walled area. The stables have not been modified. All texture mods are fully compatible. Patches for Arthmoor's mod's have packaged together in a neat little FOMOD installer called "Arthmoor's Patch Pack". It is the first Miscellaneous File on this mod page. Compatible. Use the optional file JKs Skyrim_No Lights_Patch which removes all lights and lighting markers from JK's Skyrim setting the lighting back to vanilla. This is designed to be used with all exterior Lighting Overhauls for full compatibility. Main file JK's Skyrim is still required. 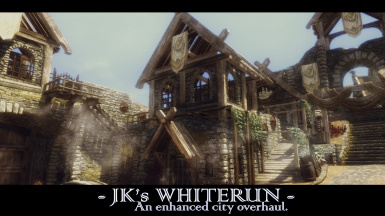 JK's Whiterun . 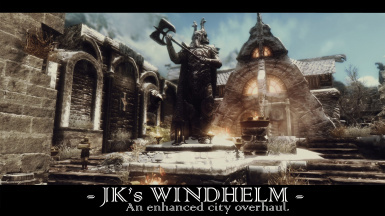 JK's Windhelm . JK's Solitude . 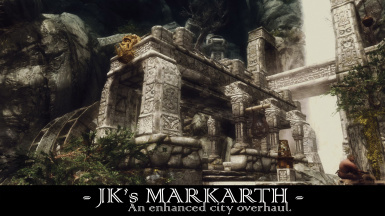 JK's Markarth . JK's Riften. 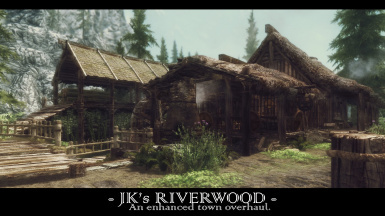 JK's Riverwood . 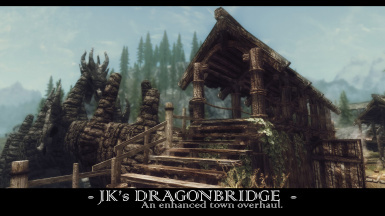 JK's Dragonbridge . 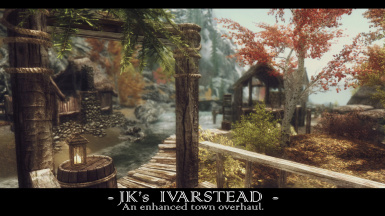 JK's Ivarstead . JK's Rorikstead . 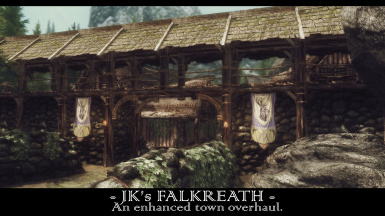 JK's Falkreath . 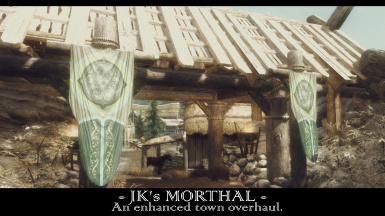 JK's Morthal. 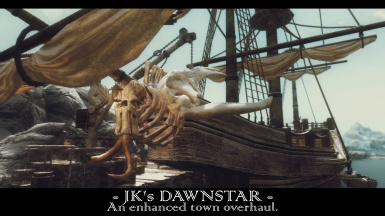 JK's Dawnstar . JK's Winterhold . JK´s Skaal village . JK's Skyhaven Forge.